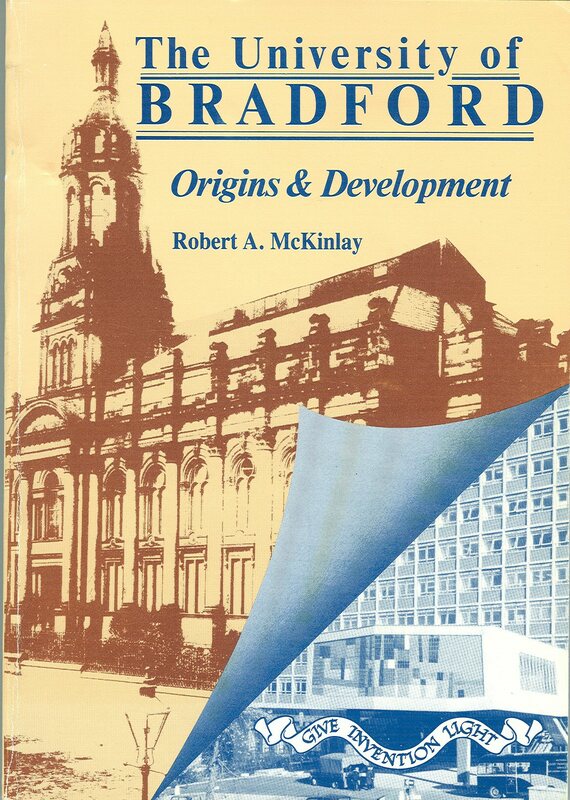 This week, two vital books for anyone interested in the University of Bradford’s story: The University of Bradford: origins and development and The University of Bradford: the early years. 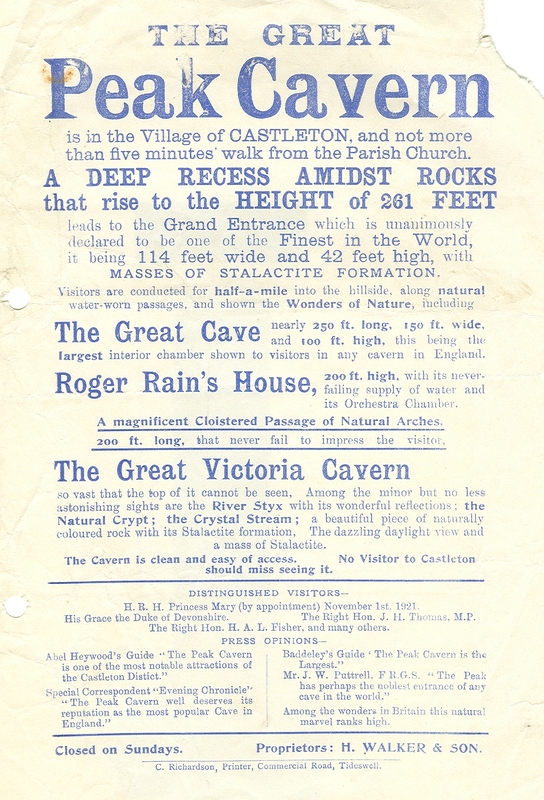 Both were written by Robert McKinlay, Vice-Principal of the Bradford Institute of Technology and later Pro-Vice Chancellor of the University. The books are incredibly useful and authoritative sources, as McKinlay combined huge experience and knowledge and scrupulous archival research. Origins covers the period up to 1966, when the University received its Charter; Early years takes us through the 1970s, with an epilogue on the 1980s and early 1990s. I draw extensively on both in writing about the Objects. The former is particularly useful on this week’s theme: how Bradford came to have a University (and why it took so long). Bradford’s University grew out of the 19th century demand for technical education and moral improvement that led to the development of Mechanics’ Institutes and colleges. However, although we can trace the University’s history back to 1882 (founding of the Technical School) and even 1832 (the Bradford Mechanics’ Institute), it did not become a Chartered University until 1966. This contrasts with the experiences of other cities such as Leeds, Manchester, Sheffield and Liverpool where the so-called “red-brick” universities were created in the late 19th and early 20th centuries. Why did it take over 100 years for the city to acquire its own University? The full story is told in over 100 pages in Origins, which is recommended if you wish to know the twists and turns of the whole tale. Here’s a summary! Many influential people were committed to the idea of a Bradford University. 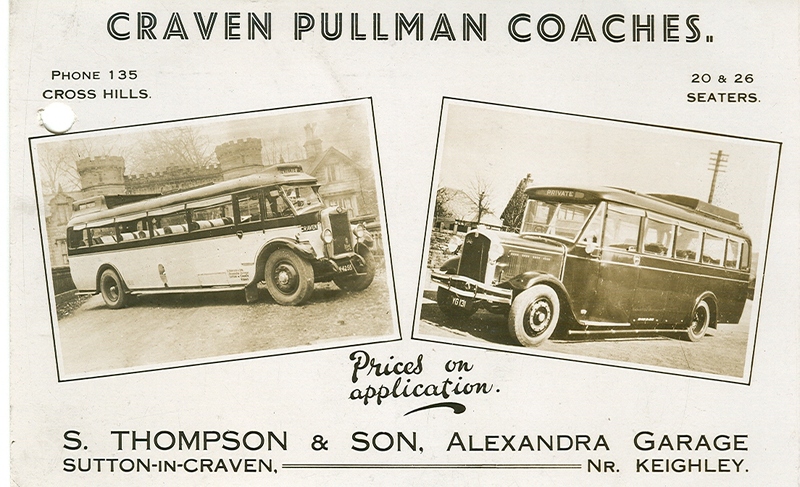 Harry Richardson, Principal of the College from 1920 to 1956, put huge effort into this cause, supported by Alderman Revis Barber and the local press. Alderman Conway, Lord Mayor of Bradford, argued that University status for the College would offer huge benefits to the region, as he explained in this collection of his articles in the Yorkshire Observer. There were occasional surges of enthusiasm and suggested initiatives involving other universities. However these did not prosper. The College’s narrow subject base and location in a textile city did not help. We might point to a lack of local civic support (textile owners perhaps tend to trust instinct and to be hostile to sharing specialist knowledge), a mistrust of technological subjects as the proper study of a university, and the perhaps unfortunate narrowing of the College’s curriculum at exactly the time two Yorkshire universities were founded (Leeds and Sheffield). Once other universities were established nearby, it would be harder for Bradford to make its case. McKinlay also suggests that the strategies employed by those in favour were too vague. Were they calling for an institute of technology or a university? Was the debate about the naming of the institution or how it was governed? Different arguments were made by different advocates. All of which gave opponents “room to manoevre”. Vice-Chancellor, Chancellor, Pro-Vice Chancellor and Deputy Vice-Chancellor : E.G. 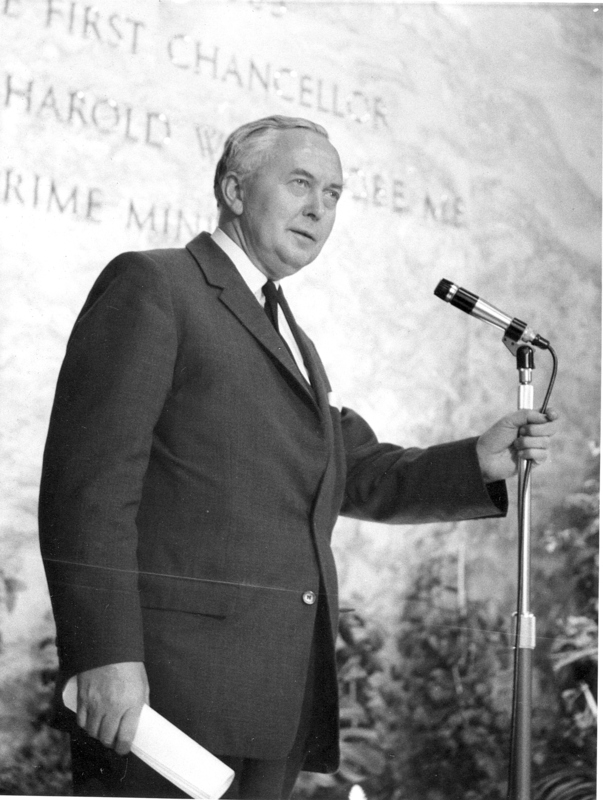 Edwards, Harold Wilson, Charles Morris and R.A. McKinlay. Late 1960s. 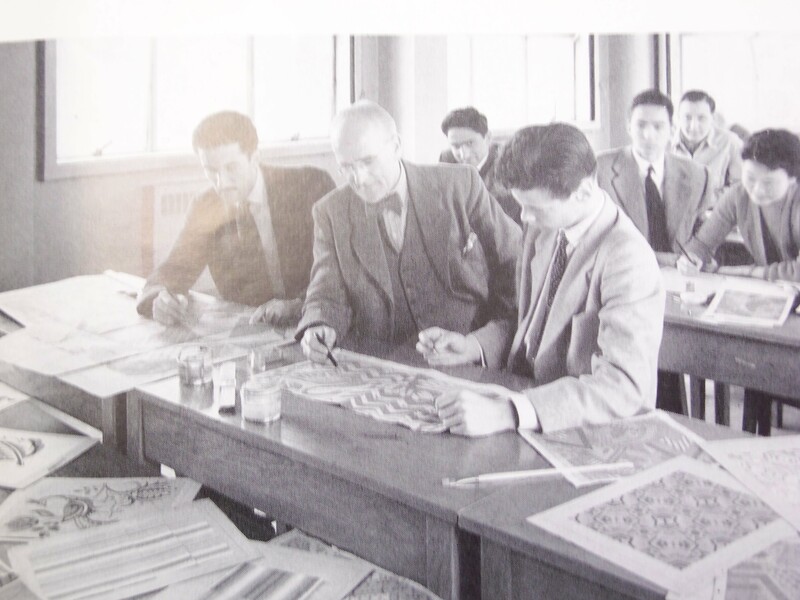 The breakthrough came in 1956 with the White Paper on Technical Education, which aimed to increase graduate numbers in technological subjects by founding Colleges of Advanced Technology. Bradford was to be one of these, a fitting retirement gift for Harry Richardson who had worked so hard for a university. This began the process of taking the organisation out of local government control and paved the way for the transformation into a University which would run its own affairs. Between the two books, we have the whole story in digested form: we are very grateful to Robert McKinlay for putting them together. 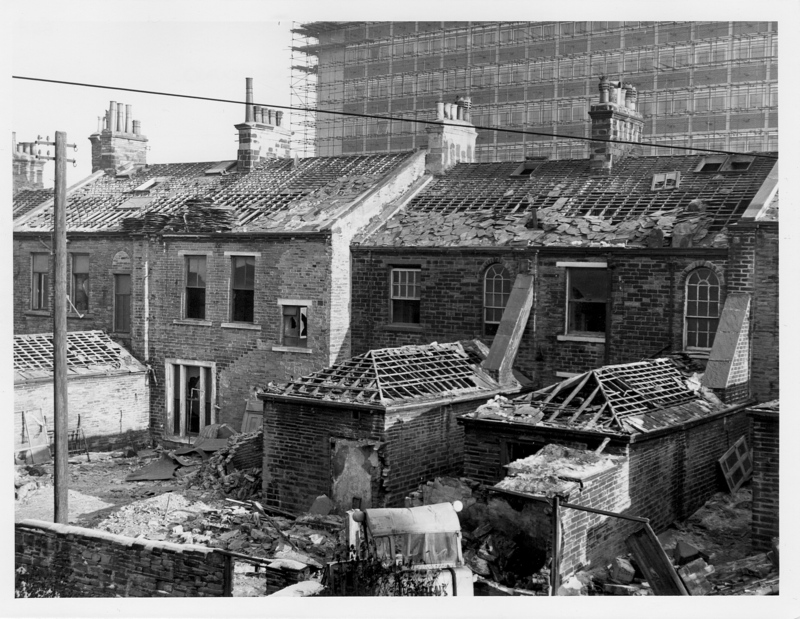 These images show the construction of the Main Building, part of Bradford Institute of Technology (BIT), which later became the University of Bradford. 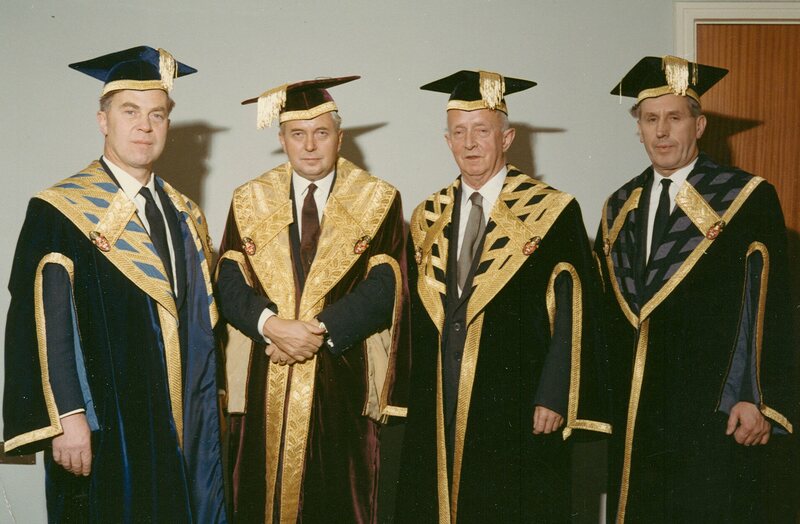 BIT was created in 1956 as a College of Advanced Technology, hiving off higher education from the College; in 1966 the Royal Charter made it a University. BIT’s short life was dominated by the need to find space for expansion: growing numbers of staff and students and better facilities for research and teaching at this higher level. The Main Building was part of the solution. Eventually the Institute and the local council decided to expand the campus into the surrounding back streets, rather than move to a greenfield site as had been suggested. As we see here, this required the demolition of many houses, with painful impact on the many people who had to move. 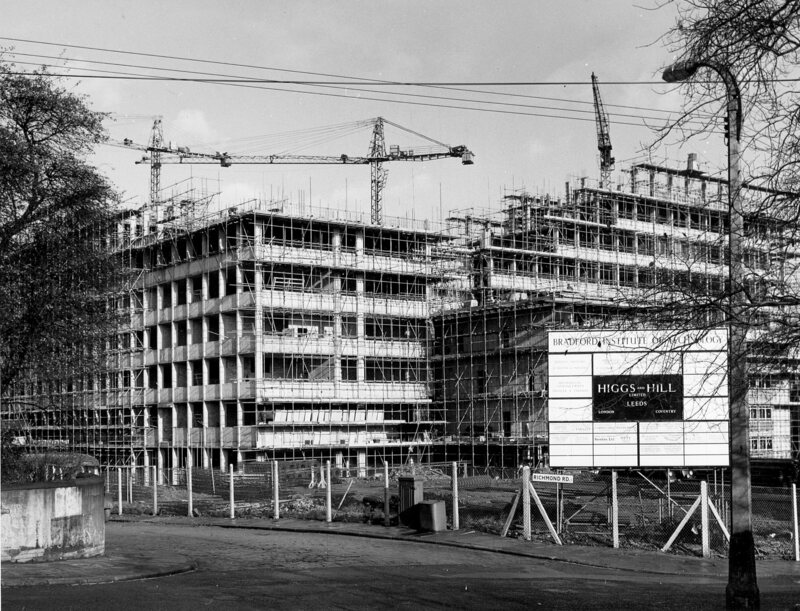 Main Building took four years to complete, beginning in May 1960, and was formally opened by Prime Minister and first Chancellor of the University Harold Wilson on 11 June 1965. Now known as Richmond Building, it has housed University administration, many academic departments and student facilities, and is probably the most visible and recognisable University building even today. (The title is taken from a quotation in Robert McKinlay’s The University of Bradford: origins and development). Two seasonal favourites, among the rare surviving materials about student life in the Bradford Technical College Archive: programmes for events organised by the Students’ Union, thirteen years apart, both on the 22nd December. 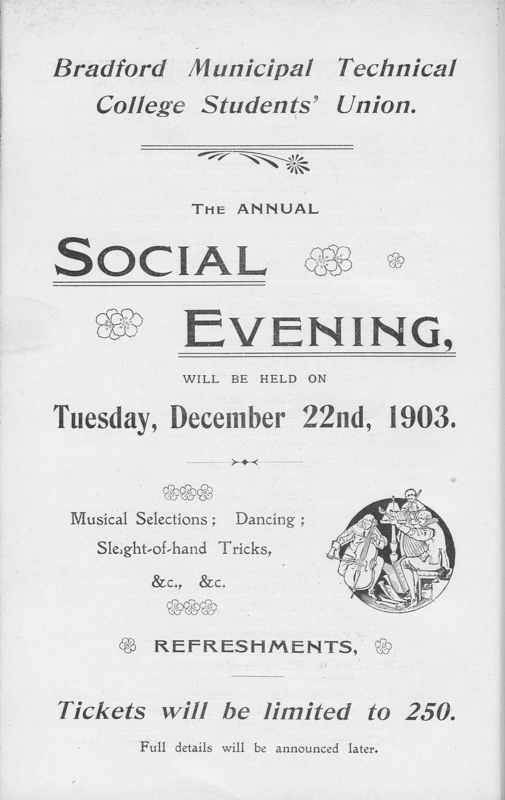 The first happened in 1903: an annual social evening, featuring musical selections, dancing and sleight of hand tricks plus, tantalisingly, “&c &c”. This single sheet has survived because it was bound with the student magazine The Collegian. 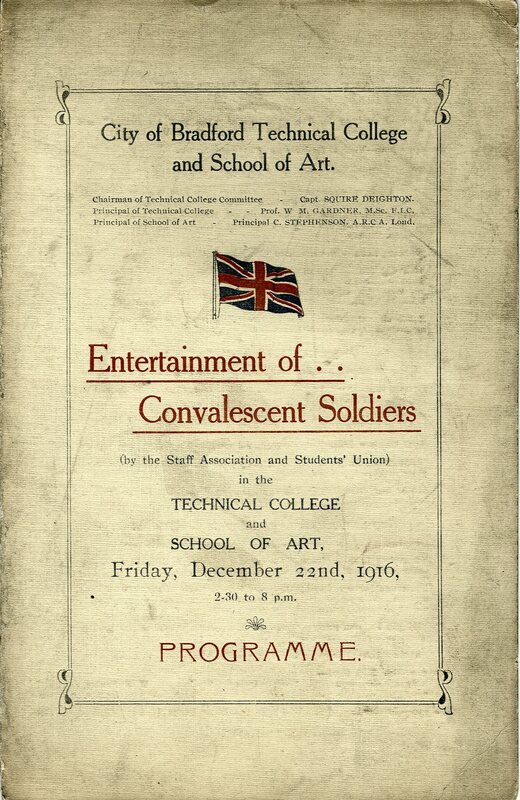 The other is an Entertainment of Convalescent Soldiers in 1916. We have the complete programme, so we can reconstruct the day: see the middle pages and the back cover on our flickr stream. The Entertainment combined promotion of the cutting edge technological facilities at the College and jolly treats. There were visits to the newish departments we saw earlier on and demonstrations of the production and properties of “liquid air” i.e. air which has been cooled until it is liquid. The demos showed the “effect of great cold on common objects: flowers, beefsteak, rubber, whisky, grapes, egg, mercury and metals”. There was also a humourist, a ventriloquist, a cinematograph, and plenty of music. We’ll be looking at more recent student activities in several of next year’s Objects, so please do come back and see us then. We would like to wish all our readers a very Merry Christmas and a fantastic 2012! 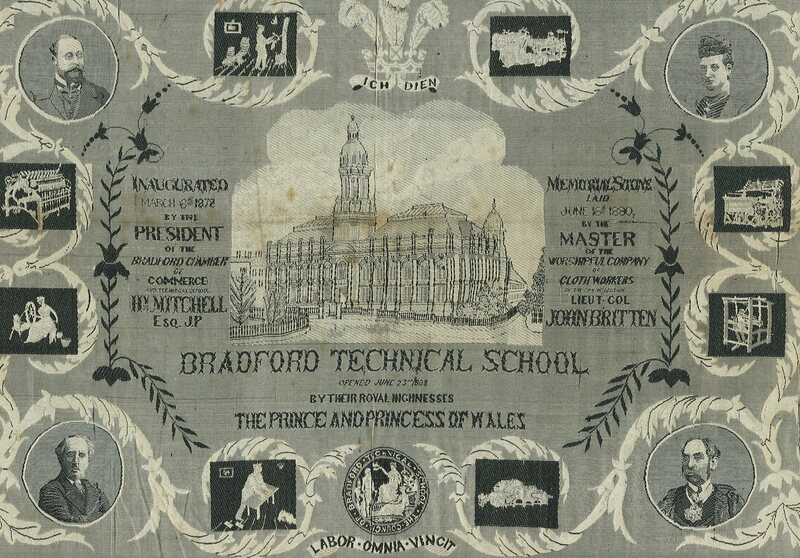 This week’s Object is a silk panel produced to commemorate the opening on 23 June 1882 of the Bradford Technical School. The Technical School later became the Technical College, eventually morphing into Bradford University and Bradford College. Woven silk panel of the 1882 Opening of Bradford Technical School (BTC 2/2). Note the city’s Latin motto at the foot: Hard work conquers all. 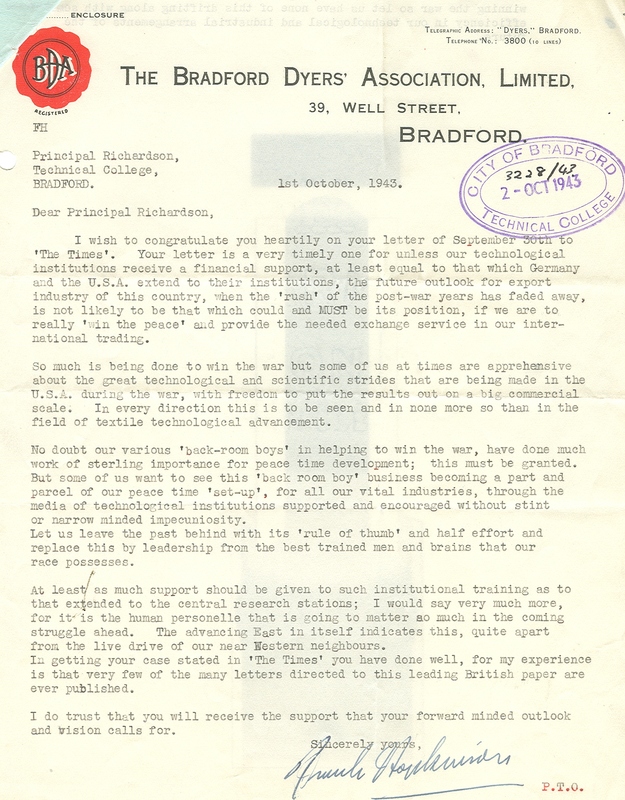 The School was set up to improve technical education in Bradford so that the city’s wool and textile industries could continue to thrive in the face of growing competition from Europe. As the Trust Deed put it: to impart “to youths, artisans and others, technical, scientific, artistic and general instruction in the various processes involved in the production of Worsted, Woollen, Silk and Cotton Fabrics and other manufactured articles …”. Detail from programme of 1882 Opening of Bradford Technical School (BTC 2/1). 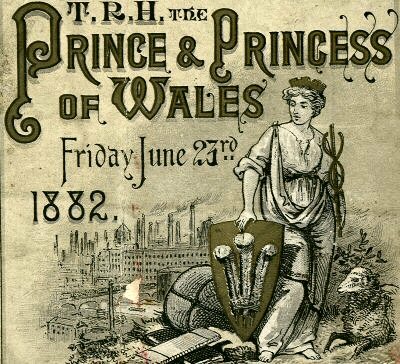 On the day, the Prince and Princess of Wales formally opened the new building for the School (which remains part of Bradford College and is now known as the Old Building). 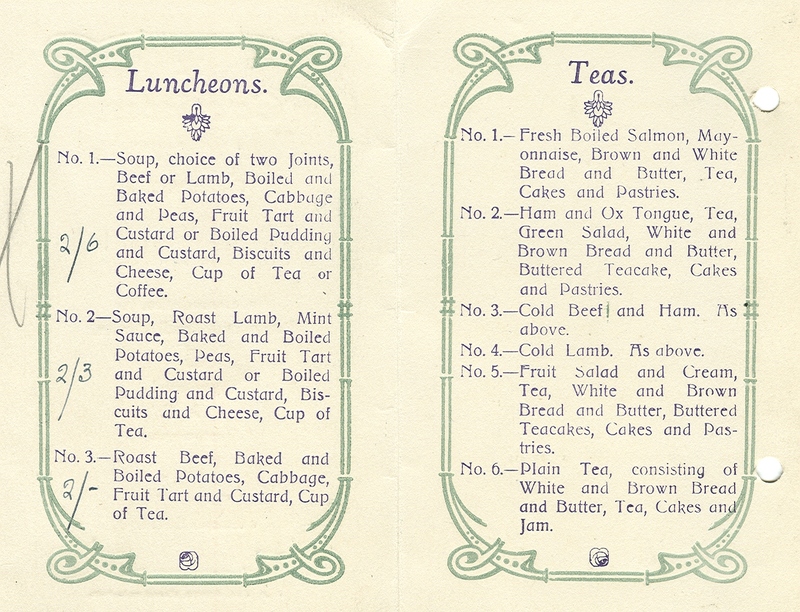 There was also a bumper Victorian lunch featuring salmon, pigeons and, naturally, Yorkshire hams. 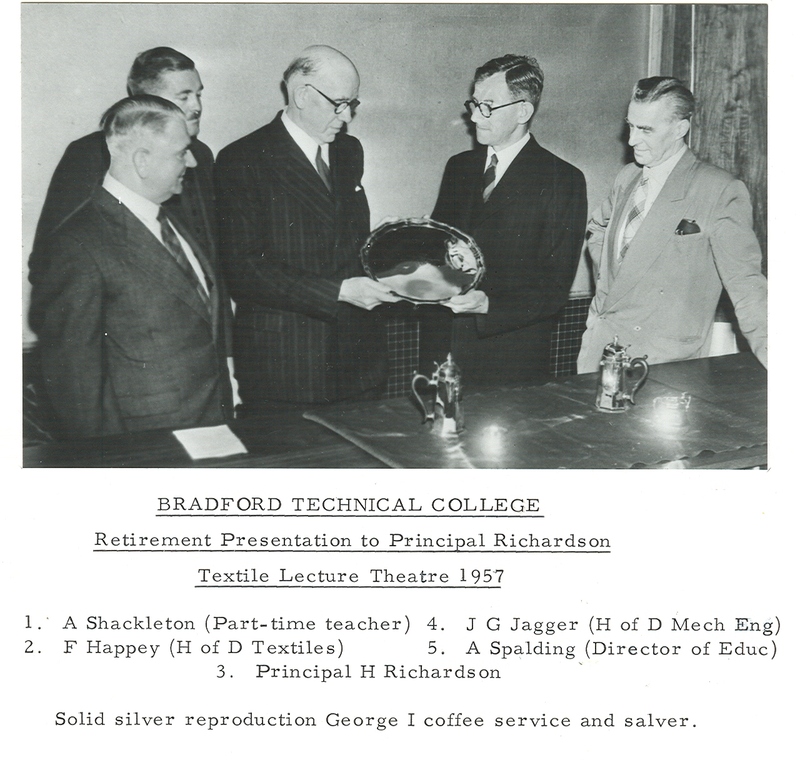 The Bradford Technical College Archive is rich in memorabilia from the event, such as the programme (detail above). The panel itself is too fragile to put on show, so this exhibition is a wonderful opportunity to highlight its story. 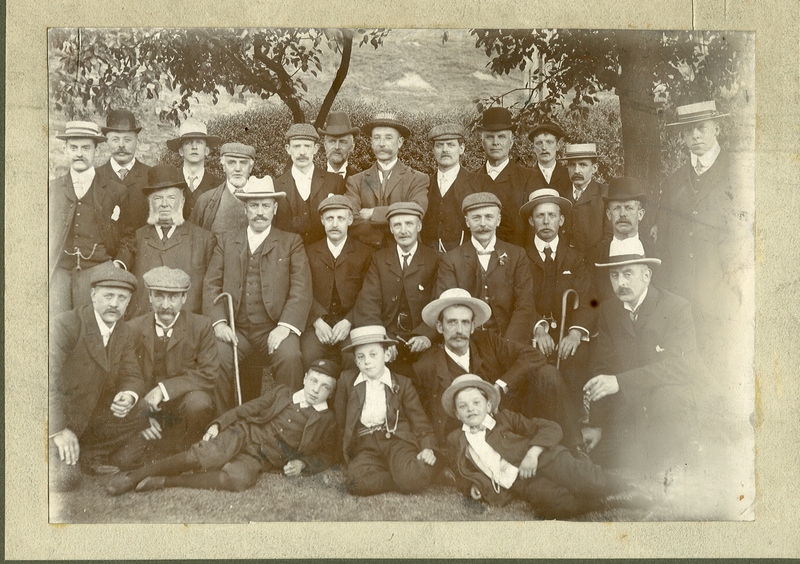 These fascinating images are taken from an album of photographs, part of the Bradford Technical College Archive. 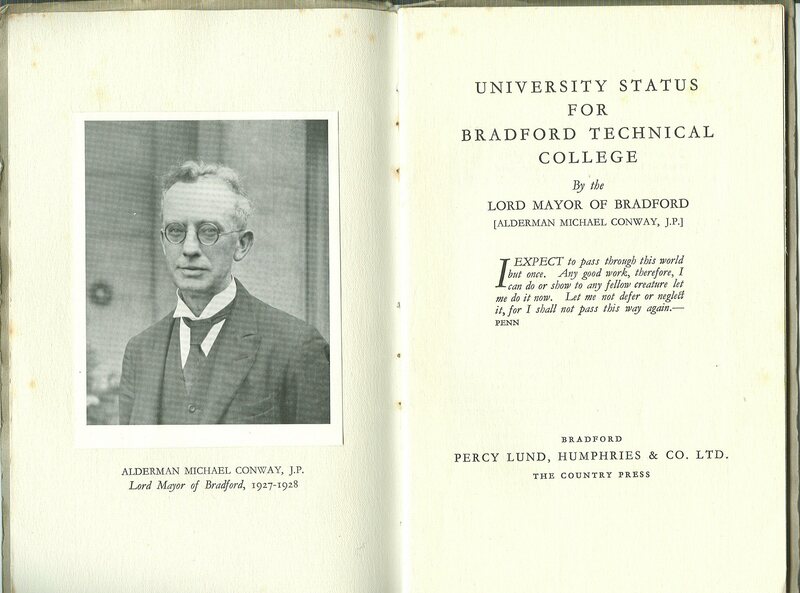 The album was put together for the 1911 opening of a new textile department at Bradford Technical College, and was presented to Alderman William Warburton, Chairman of the City’s Education Committee: the College was at that stage in its history run by the City Council. 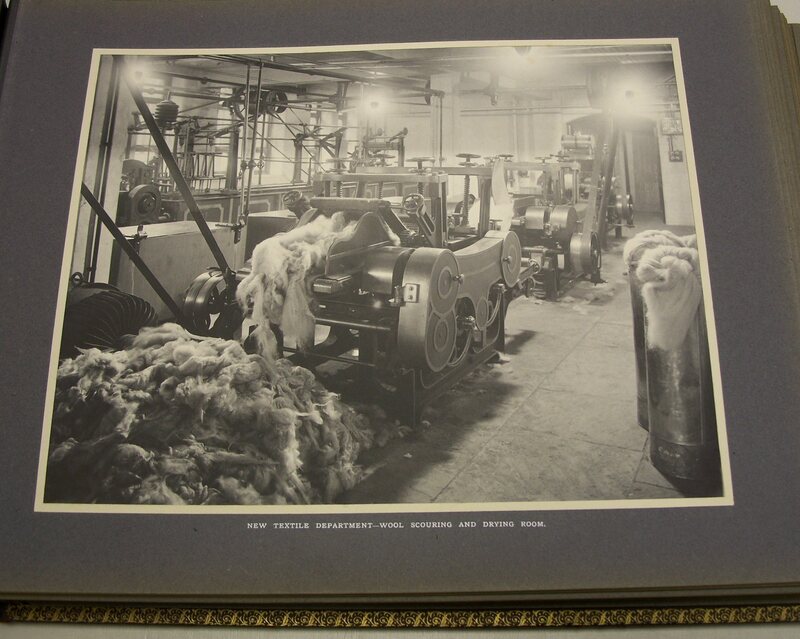 The photographs show the facilities of the new department, which was equipped with machinery similar to that students would encounter in textile mills, to carry out all operations from “the raw material to the finished cloth”. 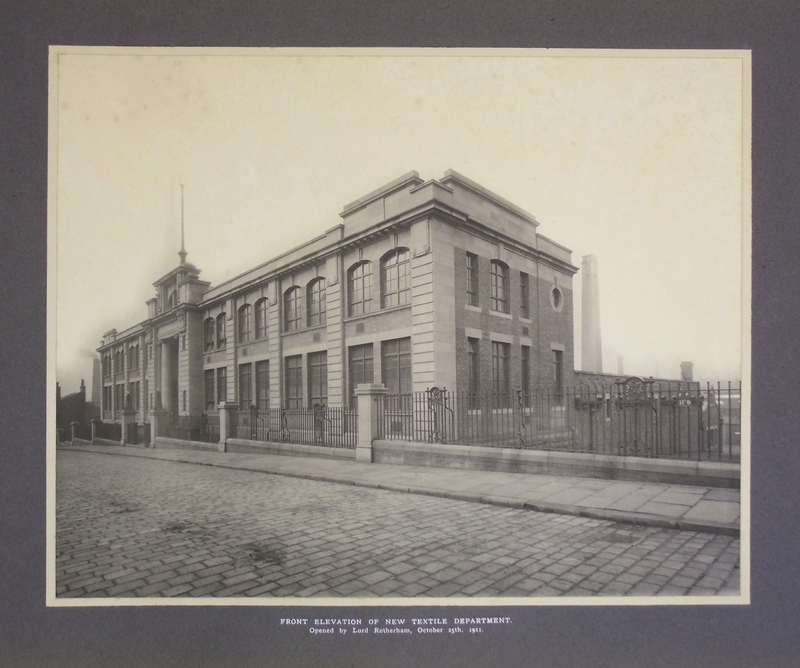 The album also showed external views of the College buildings and equipment in the other departments, such as the Motor Car Engineering Laboratory (below). The BTC had been founded in 1882, growing out of classes held by the Mechanics’ Institute. Its teaching centred on the advanced skills required by Bradford’s industries. The original departments were Textile Industries, Chemistry and Dyeing, Engineering and Art, plus a day science school, though by 1911, the Art department had become a separate School of Art, and the science school was closed. 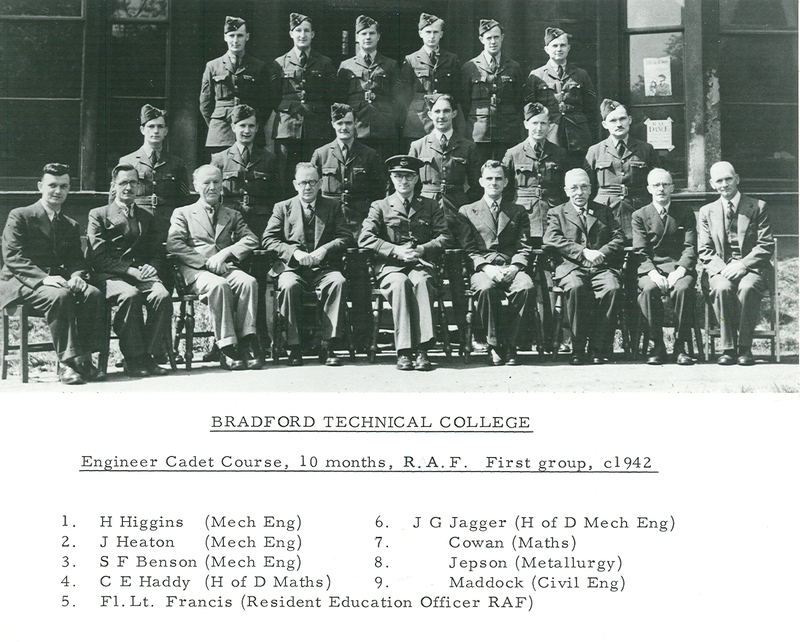 Bradford Technical College is part of the heritage of both the University of Bradford and Bradford College. 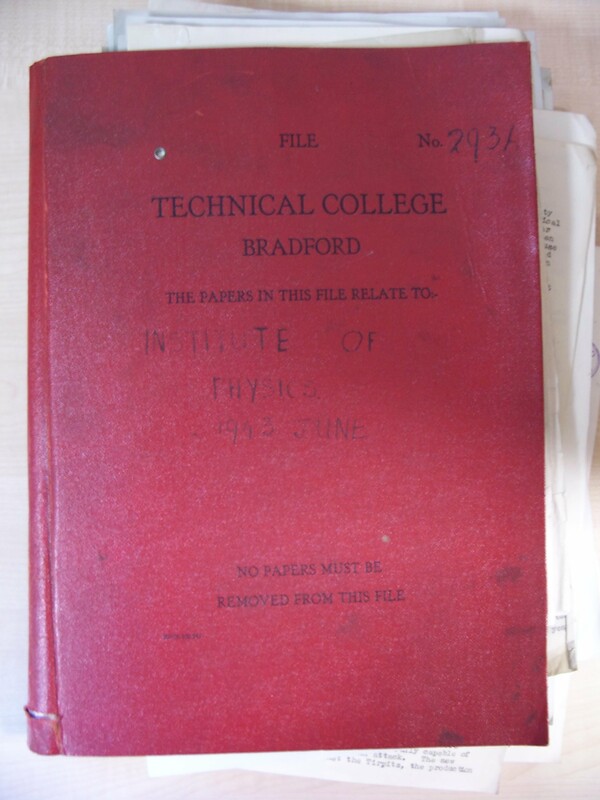 In 1959, the BTC’s higher education strand became one of the Colleges of Advanced Technology (CATS), renamed the Bradford Institute of Technology, which later became the University of Bradford. 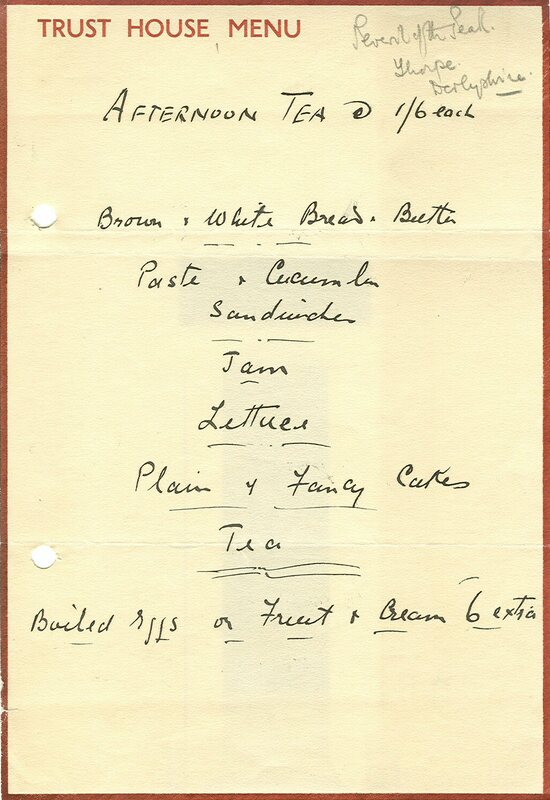 Find out more about the BTC and its successors on the Archive webpage. The full story of the various institutions which are now Bradford College can be found on their 175 heroes exhibition web pages. The new Textile Department. The building survives as part of Bradford College, is now known as the Lister Building, and when we last heard was home to departments for law, arts and media.